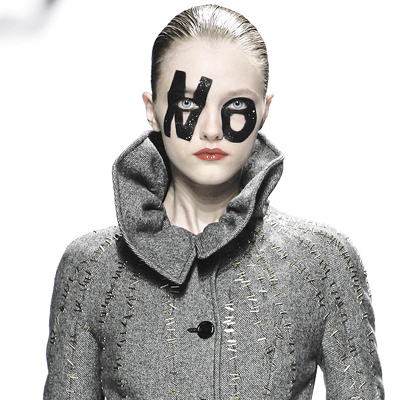 The Autumn Winter 0809 rtw show of Viktor & Rolf started with a gray wool trench, a three dimensional rendering of the word ‘no’ popping out from its chest and ended with a strapless black tule dress gathered below the knee and embroidered with the words ‘dream on’. The garments were gold stapled together in parts to symbolise the speed at which designers were expected to work. ‘We love fashion, but it’s going so fast. 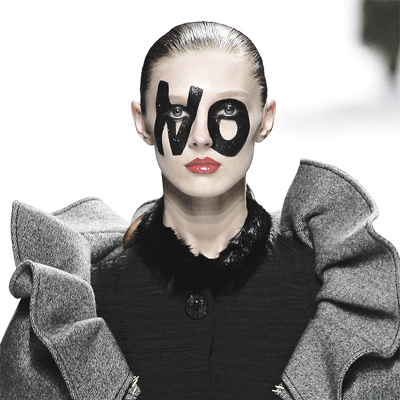 We wanted to say ‘No’ this season’ spoke Viktor Horsting and Rolf Snoeren to a group of devoted fans and curious reporters eager to parse the meaning of the fashion show.